Renovated November 2017, this dazzling vacation home "Indulge in Luxury" is situated on the 4th hole of the Tom Watson golf course. The villa can accommodate up to up 18 guests with five master suites and a magical kid's bedroom, all with en-suite bathroom. 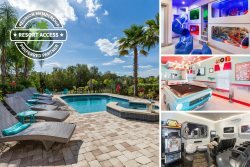 Enjoy the unique movie & games room, spectacular private pool, spillover spa, outdoor kitchen and more with all members of your party on your next vacation. As soon as you step through the iron gates to your own private courtyard equipped with a soothing water fountain, you will instantly feel like your vacation has begun. Inside the home you will be amazed at the amount of detail that went into the design of this home: hand-painted faux wood finishes and plaster designs, hand detailed archways, custom tile and woodwork, granite counter tops, superior fixtures, appliances, and custom built-ins. On the first floor off from the grand open living area, you will find the first master suite, formal sitting room, an elegant dining room, luxury chef's kitchen, wine bar area, and eating nook. The second floor boasts another master suite with a balcony overlooking the pool, spa and golf course. There is also another master suite and queen bedroom located on the second floor. Step into the magical alley, inspired by the Wizarding World, where the little ones will have an amazing custom-built bedroom with three twin over twin bunk beds. As an added bonus, this home also boasts a 6th bedroom that is located in a detached guest studio, perfect for parties who have guests that will appreciate the extra privacy. Take full advantage of the Florida sunshine by your private pool and spa overlooking the golf course. There is even a summer kitchen that will be perfect to prepare a family dinner poolside. Looking for entertainment? Then step into the unique movie and games room with a 70-Inch SMART TV, sports bar, 120-inch projection screen, classic arcade system, an air hockey and pool table. This room has plenty for guests of all ages to enjoy. Pool heat available for a fee. If you would like the Spa / Hot Tub to be heated you will need to add pool heat to your reservation. The complementary BBQ grill is provided free of charge. The management company and/or the Owner do not accept liability for equipment failure. It is the guest’s responsibility to clean and maintain the barbecue and replenish Propane as required. This home does NOT come with use of an external fireplace, the fireplace is disabled for safety reasons.